Six bears who spent at least 12 years on a bile farm in southern Vietnam arrived safely at Animals Asia’s Vietnam Bear Rescue Centre on Monday Dec 11 following an epic three-day road trip covering 1,600km (994 miles). The “Wish Come True” rescue mission, overseen by an Animals Asia vet and supported by a vet nurse and bear manager, began on Friday Dec 8 in Binh Duong province which has become a hotspot for the illegal bear bile trade in Vietnam. The three male bears have been called Tim (Vietnamese for heart), Manu (Maori for bird) and Mana (Maori for courage) by their rescuers; and three female bears are known as Anh Sang (Vietnamese for light), Mia (Vietnamese for sugar cane) and Holly. The Maori names were inspired by Animals Asia’s bear manager on the rescue who is from New Zealand. The six bears were released one by one from their cages, where they had endured painful bile extractions for more than a decade, and received a visual health inspection by the team before being transferred into a transport cage and placed on a truck for the long journey home. As is typical of bile farm bears, all six rescued bears are in poor physical condition. One of the bears - Holly - was missing her left forepaw while her left hindpaw was heavily mutilated. Both injuries are believed to have been caused when she was trapped in the wild. Another male bear - Mana - is believed to be blind, after showing no reaction to visual stimulation. The journey along the length of Vietnam was punctuated by frequent stops to rest the bears and provide them with fresh water, leaves for nesting and plenty of watermelon, dragonfruit, pumpkin and other fruit and vegetables. The last leg of the journey was completed on Monday with the bears arriving at Animals Asia’s Vietnam Bear Rescue Centre in Tao Dam National Park at 4pm local time. The bears will now start a 45-day quarantine before embarking on a rehabilitation programme at the 11-hectare sanctuary which will hopefully culminate in them living in large, semi-natural enclosures alongside 170 other rescued bears. The rescue was the fourth undertaken this year by Animals Asia and brings the number of bears rescued by the charity in 2017 to 18. In the past 19 years, Animals Asia has rescued more than 600 bears in Vietnam and China. “Even though we have a wealth of experience in rescuing bears from across Vietnam, every rescue is different. It is always an enormous relief to drive through the gates of our sanctuary with all the bears safe and as well as they can be, given the difficult circumstances. “Now the priority is to give each bear a thorough medical examination and treat any urgent conditions quickly. We had to give Holly some pain relief on the journey because her injuries were causing some distress, so we’ll want to check that and Mana’s eyesight as quickly as possible. Other problems that we haven’t detected so far may be revealed after the health checks. 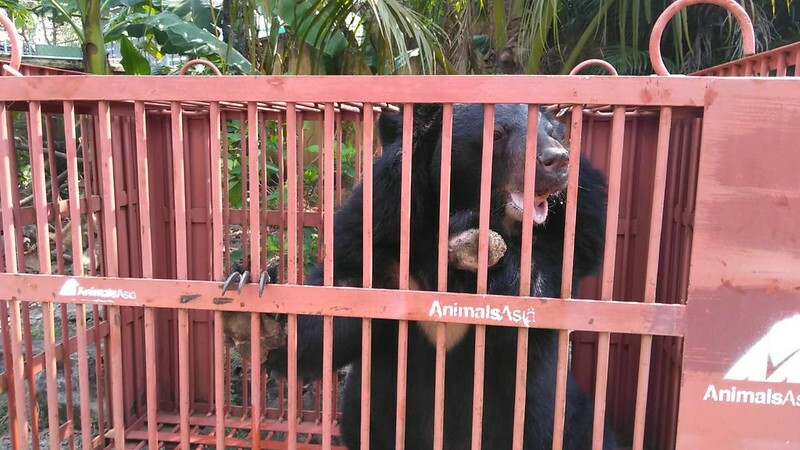 The six bears were voluntarily handed over by one of their owners, Nguyen Tien Ngoc, a businessman who over the past decade or so has had a change of heart about farming bears. Originally from a bile farming hotspot near Hanoi, Tien decided to farm bears when he moved to Binh Duong province - until he was made aware of the cruelty of the trade by Animals Asia. In 2011, Tien transferred 14 bears he owned to the charity, but other bears on the farm remained because their co-owners refused to release them to sanctuary. After years of trying, Tien finally persuaded his business partners to do the right thing and hand six bears over to Animals Asia. Each bear has been microchipped, suggesting they have been on the farm since at least 2005 when Vietnam introduced legislation to ban the extraction of bear bile, which has long been prescribed as a traditional medicine to remedy a variety of ailments. Bear bile farming technically became illegal in Vietnam in 1992 when the government passed a law requiring state approval to keep bears, but loopholes resulted in the practice continuing. Binh Duong, the province where the rescue took place, is a major hotspot for bile farming in Vietnam, behind only Hanoi and Ho Chi Minh City. In 2005, there were 317 bears in Binh Duong but by 2014, the number had plummeted to 155. There are believed to be around 1,000 bears still caged on bile farms in Vietnam. Under a memorandum of understanding signed by the Vietnam government and Animals Asia in 2017, all remaining farmed bears will be rescued and the bear bile trade eradicated within five years.